Thanks for joining FX Junction, the world’s largest OPEN social network for Forex traders in the world! Maintain full control of whom, how and when you want to copy. Keep your existing brokerage account and benefit from the best trading conditions you negotiate. Choose from any of the signal provider’s 3 possible fee models offering you greater flexibility. Many signal providers offer free trials before you pay. Analyze thousands of traders with over 100 analytical statistics allowing you to choose the best traders that fit your needs. Founded in 2011, FX Junction is the most established and transparent open social trading platform. FX Junction has no conflicts of interest with its members. FX Junction is not a broker, introducing broker or asset manager. We charge the signal providers a percentage of what is charged to you. FX Junction offers over 100 analytical statistics to help you indentify traders. On the Find Traders page, you have access to all traders which have linked their account to FX Junction. Before a trader can be a signal provider they must comply with the following criteria in the picture below before submitting their request for approval, meaning all items must have a green checkmark and attach all required documentation. Validated signal providers does not mean FX Junction recommends any signal provider, it is only measures we have in place to ensure transparency. Trader Filter: FX Junction provides multiple filters to quickly narrow down the list of traders. First you must select Signal Provider Status Validated to see only authorized traders to share their strategies for AutoCopy. Sort: After applying your filters, you can sort accounts with the following metrics. Select: Once you have successfully filtered and sorted traders, click on a trader to access more analytics. Trading Profile: View what country the trader and details of the selected account. Trading Activity: Monitor the traders current positions and full trade history since linked to FX Junction. Performance: Analyze over 100 statistics in a summary table, over time period and by instrument in a table and graphical format. Follow: After identifying traders you are considering to AutoCopy, follow them first. You can view their live posts and trades on the dashboard. In addition, you can send them private messages using the FX Junction mail system to ask any questions about their strategy before deciding to AutoCopy. Once you identified your traders to AutoCopy, you need to add them to your AutoCopying page. Position Sizing: Input what type of Autocopy including Fixed Lot Size, % of your Account's Equity, and % of Signal Providers Lot. 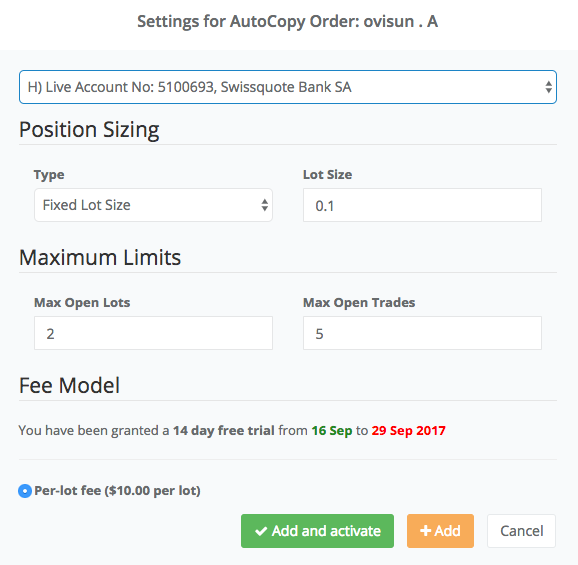 Maximum Limits: Input the maximum number of open lots and open trades you are wiling to accept to be AutoCopied. No more new trades will be AutoCopied once threshold is reached. Fee Model: There are three models offered to signal providers to set including Fee per lot, Fee per trade and Subscription. Choose from one of the available fee models offered. Some signal providers offer a free trial before purchasing signals. If you have not purchased Credits yet, then select +Add to add the trader to your AutoCopying page. This does not enable them to AutoCopy yet until you enable them from the AutoCopying page. Once your traders are added, go to Credits page to purchase credits through one of our available payment service providers. It is best you analyze the fee model you selected for each signal provider to estimate how much credits you need to purchase. If you run out of credits, the autocopy system is disabled until you purchase additional credits. After purchasing credits, go to Trading Profile page and select AutoCopying tab. You will see the signal provider you added which currently displays Off. 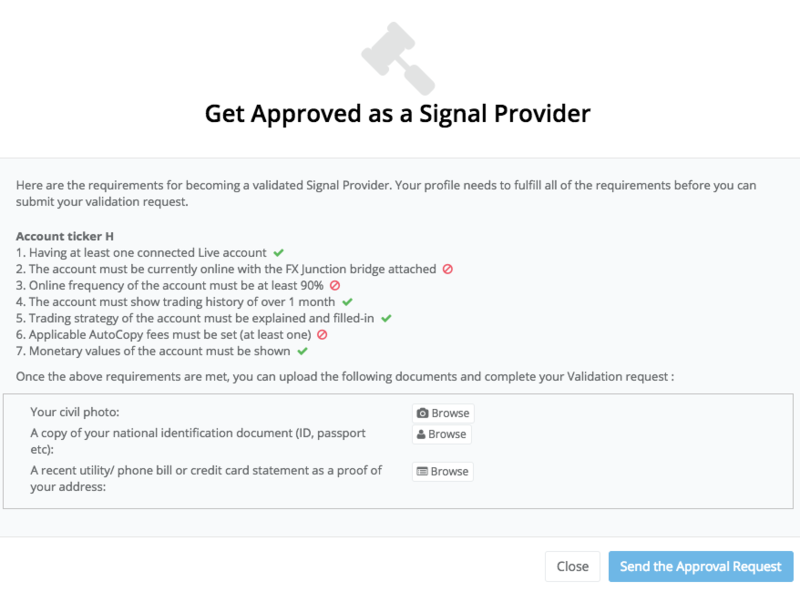 Review again the criteria you set once you added the signal provider to make sure it's correct. If acceptable, then turn AutoCopy On. 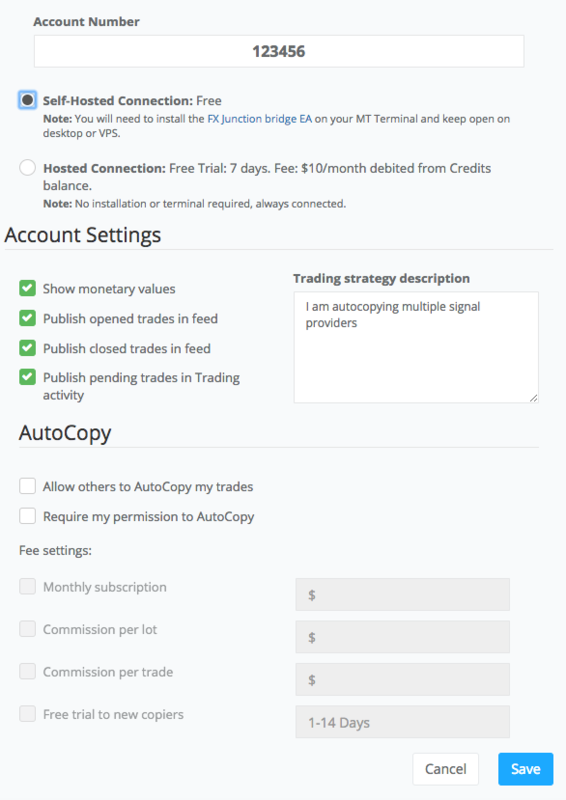 If the Signal Provider doesn't have enabled "Require my permission for AutoCopy" set, then the next trade shared by the signal provider on FX Junction will be AutoCopied onto your brokerage account. Note: If AutoCopying multiple signal providers, you can set a global max open lots and trades limit in addition to the limits you set on each individual signal provider. In addition, if you or the signal provider's platform disconnects from FX Junction, trades will become orphaned. You can turn on/off if you want these orphaned trades Auto-Closed. AutoCopy: To remove or modify any of your signal providers, go to the AutoCopying page and select on of the options under the Actions column. Credits: Carefully monitor your credits balance to ensure you have enough buffer to pay for AutoCopy fees. If your credits run out, AutoCopy is disabled until you purchase more credits. Mailbox: Monitor your FX Junction mailbox for any updates from your signal providers. Trading Activity: Compare the trading activity on FX Junction with your brokerage account to make sure there are no differences. Logs: Monitor the Log section on your Trading profile page to monitor slippage between you and your signal provider. If you experience mostly negative slippage, you should stop AutoCopy immediately as your performance will be lower than the signal provider. Negative slippage could be due to several reasons including the signal provider has better pricing from their broker compared to you or price latency between you and the signal provider. The log can also quickly identify any errors. Please email [email protected] if you need any assistance.